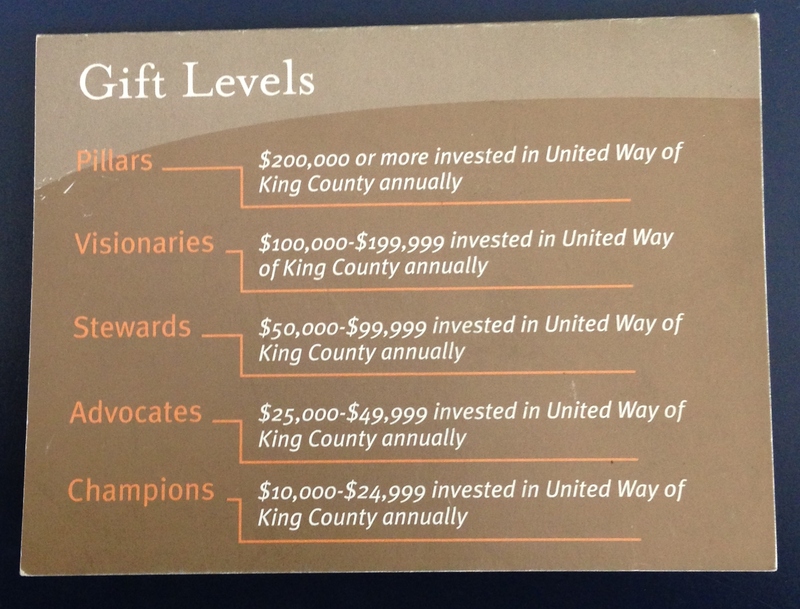 When I was a Donor Relations Manager at United Way of King County, one year our Campaign Chair asked for a handy guide, something that he could place in the breast pocket of his suits. He wanted something he could easily refer to before speaking or meeting with donors and prospects, listing the campaign goals and succinctly mentioning key points. 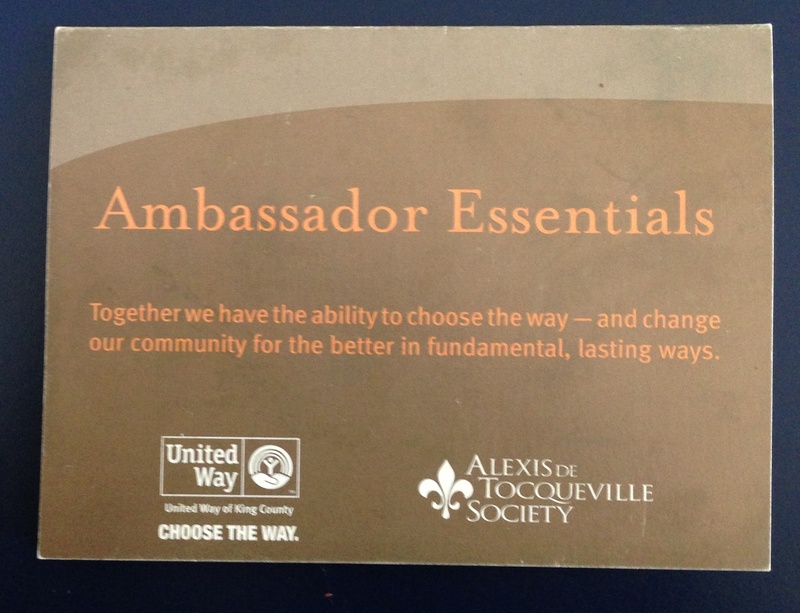 The Brand department put together this handy guide for the Ambassadors of the Alexis de Tocqueville Society, for the Campaign Cabinet and for the Board. I recall it was a small run, about 100 or so, and printed on coated stock. And yes, they fit into a suit jacket, or a wallet, or a purse or a pocket. The fundraising team was so happy to have our Ambassadors and key volunteers have these in-hand. Right there was the “dashboard:” our financial goals for the year and our donor retention and new supporter goals as well. 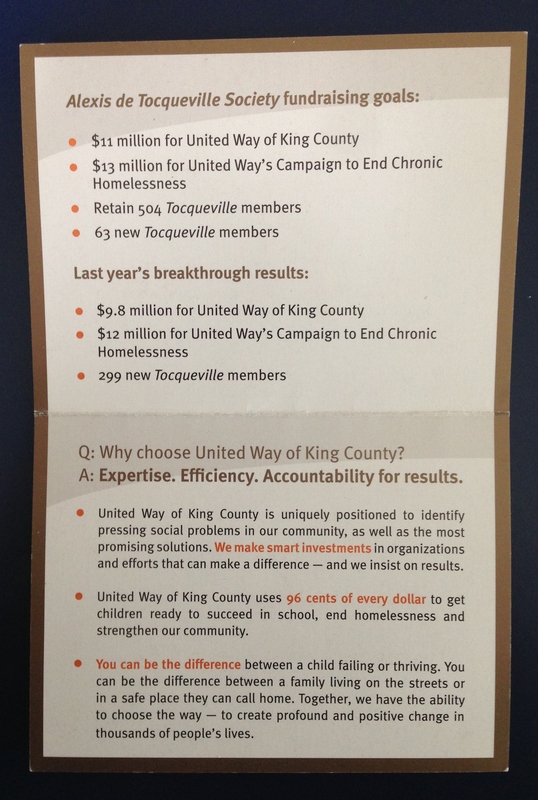 Right there was the answer the donor question, “Why United Way of King County?” The two key investment points for the community – the areas of focus that would strengthen the community if we started tackling them now – were ending homelessness and early learning, before kids started school. Oftentimes, just knowing that the little helper was there was enough for the Ambassadors or other volunteers to feel confident in speaking about why their friends and peers should support the community through United Way. And, since giving to the Alexis de Tocqueville Society starts at $10,000 annually, it was also helpful to have our local giving levels on the reverse. I’ve always kept this one around and created others (why re-invent the wheel?) for our donor-volunteers and connectors. 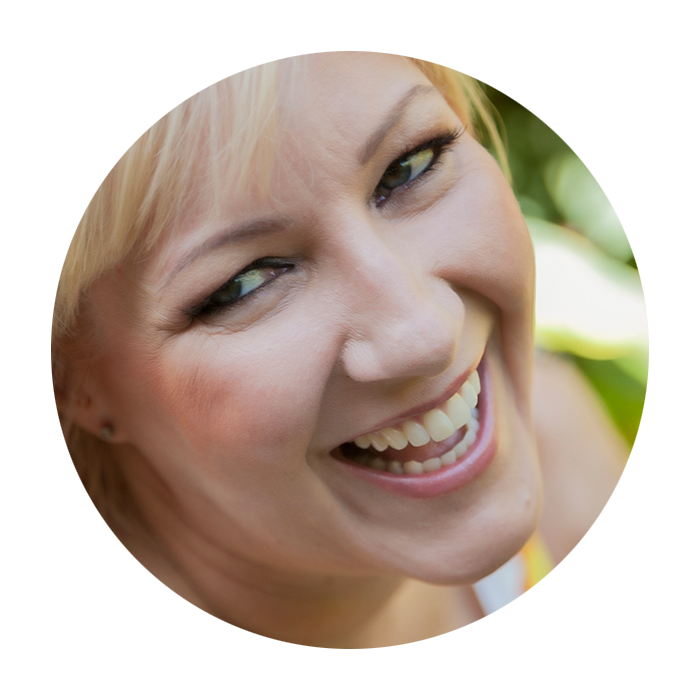 Are you offering your champions – however the appear to fight on behalf of your cause – a variety tools that they can use to help you? Great idea, Beth! I’ll be “borrowing” this one, for sure! Thanks. Thanks, Mary! We were even skeptical… (what? something to put in your pocket? but it is how Blake Nordstrom likes to organize himself) and then Jeff Raikes, the Campaign chair, LOVED it! So, if the ones asking liked it, that is all that we should really care about. It was also a good lesson to put skepticism aside… we are in this info all day, every day but volunteers like them have so much on the go… this was a quick way to get immersed.